From a photography blog called Shorpy I found a little photo retreospective of the corner of 14th and Irving. 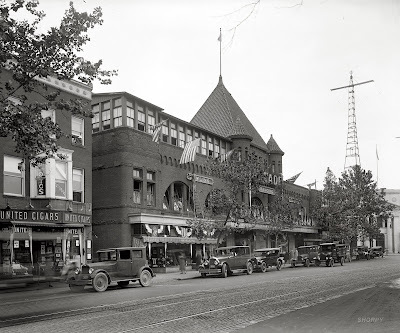 Where DCUSA and Target now tower over Columbia Heights once stood the "Arcade Market," capable of accommodating hundreds of merchants. It opened in 1910, complete with "a balcony for ladies that overlooks the entire market." The marketplace was formerly a streetcar barn, which accounts for the large arched doors. The last remaining piece of the original structure is the facade that was preserved on Irving Street and will be home to the incoming Elwood Thomas grocery. Check out the high-resolution photos of the first two (click on the photos to enlarge, or visit the original source using the links to see ridiculously high-resolution versions of these photos). There are some incredible details captured, like the man changing the lightbulbs on the "Bowling" sign, and the two women looking out the window above the cigar store. I think the two photos of the arcade you have on there are actually on the 14th street side, though. There was never a streetcar line running on Irving that I'm aware of, but definitely one on 14th. (Tracks in the photo) And you can see the front of the bank at Park all the way to the right of one of them. There was another building there after the Arcade was torn down too, I believe. You're right - note the Riggs Bank building in the old pics which still stands. the old post office on irving street is where i picked up my mail order phish tix way back in 96when we went to the great went? it holds a special place in my heart! 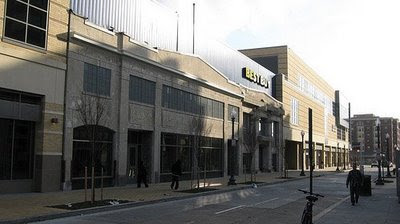 The garage facade incorporated into DCUSA was not a part of the Arcade (see the ca. 1925 photo above - the Arcade sat closer to the center of the block on 14th between Park and Irving, w/no facades on either of the latter two). The Irving garage did house a business called Arcade Auto Repair for many years, though. 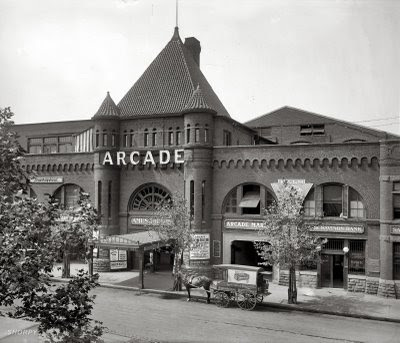 The Arcade was completely razed sometime in the mid-1950s.